The Financial Regulation XBRL ontology is a one-to-one complete OWL/RDF representation of eXsensible Business Reporting Language) schema. XBRL is the dominant global standard for exchanging business information. The Securities and Exchange Commission (SEC) and the Federal Deposit Insurance Corporation (FDIC) mandate financial filings in XBRL. Global adaptation came along International Financial Reporting Standards (IFRS). European regulators for Banking and Insurance define reporting requirements as XBRL Taxonomies. The financial institution compliance filings are XBRL instance files. The Financial Regulation Ontology (FinRegOnt) extends and aligns the two domain reference ontologies. An ontology must hold real data, read and write forms & reports data to be operational . That means the institutions information stored in FIBO, laws, regulations and rules in LKIF. The ontology must be able to produce regulatory filings. US (banking) Call Report, EU (insurance) Solvency II and many other forms & reports stipulate submission in XBRL For the European insurance supervisor, EIOPA taxonomy, we needed to produce Eurofiling compliant XBRL instance files. Eurofiling is a really revolutionary harmonization. It has taxonomy extensions to XBRL that are common to banking, insurance, securities and central bank reporting. (while here at US home the 50 States still regulate insurance business). Why yet another? Quite simple, we needed an XBRL ontology that works for EIOPA and Eurofiling. To meet the requirement, the ontology must be complete, covering all elements in the XML schema and all XBRL specifications. 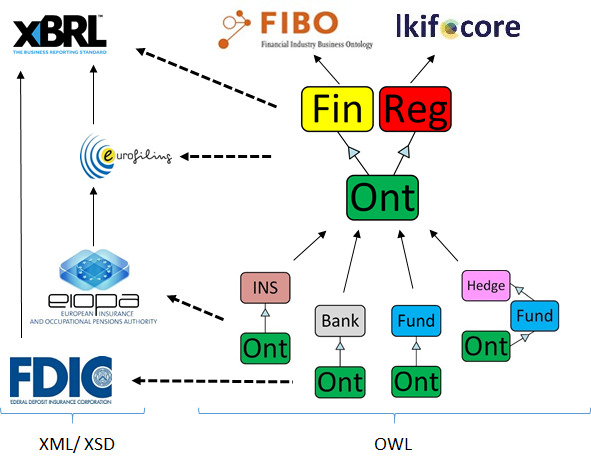 The Financial Regulation XBRL ontology is the only Open Source RDF/OWL that covers all XBRL.org specification: base (instance, linkbase, Xlink), generic, formula, table, ,,,, , and taxonomy. I didn’t find any published ontology that fits the bill. The FinRegOnt XBRL ontology has all essential specifications. The diagram shows the import graph. The ontology works for the banking FDIC Call Report. We can load filings and run SELECT statements in SPARQL (the Semantic Web SQL). Here is the query. And here, FFIEC public Excel report vs. SPARQL query results. Enhance the raw import with semantics. Load the Solvency II taxonomy into LKIF This is the same as we did for a real ontology model of USC and CFR. Load the report financial information into FIBO classes. The Fund Ontology already has an example of FIBO populated with Investment Advisers from the Securities and Exchange Commission form ADV (advisers) compilation report. The complete techinial article on the FinRegOnt website (more content tables and less opinionated). With links to the ontology files for download. The Financial Regulation tutorial chapter one with a Finance intro to OWL and the reference ontologies. Chapter two with details on reverse engineering XML/XSD – example is for Code of Federal Regulations (CFR) and United States Code (CFR). Thanks for reading his far. I appreaciate your feedback. Please respond with your questions. corrections, and suggestions on LinkedIn or email me jziemer@jayzed.com .